Everyone wants to make money online but there is no shortcut for this. You need to invest your time, technical knowledge before you earn anything. Here ,i present link referral method by which you can easily earn money without investing and it is very easy method and take less than one minute. Link referral is refering someonevia advertiser link and advertiser pays you as Pay per visit. So, if your link visited by 1000 people in 1 minute ( like link posted on Facebook page e.g Friends, Ricky Martin) you will earn atleast $1 to $10 , depends upon your visitors location. 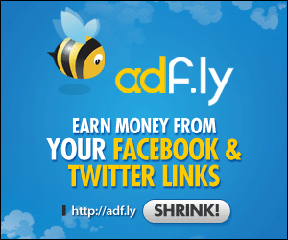 Adf.ly is the most popular link referral service. It will give you 0.001$ visit / link . Although , it looks very small but its for 1 link . Imagine, you have 100 links with adf.ly code and 1000 visit atleast per hour. So , in one hour you will get 0.001X 100X1000= $100/ hour minimum. You can even earn more if visitor came from USA and other countries. 1. First , join adf.ly and create an account. 2. Now place url in box which you want to shrink and click shrink. 4. Just share this link everywhere on internet. 5. All done ! more visits, more you earn. It is the most easiest way to earn money online .So,Just try this site and leave your comments below about this method.